Up Close: Antares and the Moon as they will look at 3:16 a.m. local time on March 3 from Phoenix, AZ. As the Moon makes its monthly circuit around the sky it often passes in front of stars, blotting them out for as much as an hour or so. Such an event is called an occultation (derived from the Latin word occultare, which means "to conceal. "), and it can be a startling spectacle, especially if the star happens to be bright. The star appears to creep up to the Moon's limb, hangs on the edge for a minute or two, and then, without warning, abruptly winks out. Later it pops back into view just as suddenly on the Moon's other side. The suddenness with which occultations take place was one of the first proofs that the Moon has no atmosphere. If our natural satellite were cloaked with an atmosphere, a star approaching its limb would appear to fade away gradually, just like one seen setting beyond the western horizon from here on the Earth. The action begins when Antares disappears behind the Moon's bright limb. This event will probably require a small telescope, because glare from the Moon's sunlit edge will tend to hide the star. For those living in the northwestern United States as well as western and southern Canada, the Moon may be barely above the horizon, so poor seeing -- atmospheric turbulence -- will compound the problem. Over the Pacific Northwest, Antares' disappearance will not be visible because Moon and star will have not yet risen. For much of eastern North America, it's a different problem: morning twilight will already be in progress, while unfortunately for Cape Cod, Massachusetts, Maine and the Canadian Maritime Provinces the Sun will have already come up when the Moon covers Antares. The star's reappearance will be spectacular wherever the Moon is up in a dark sky. If you live anywhere to the west of a line that runs roughly from Minot, North Dakota south to Laredo, Texas, the sky will be completely dark when Antares springs into view from behind the Moon's dark edge. Its sudden emergence should be able to be seen with the unaided eye if you have good vision, however the Moon's glare might hinder the visibility of Antares. So block as much of the Moon's sunlit portion as you can with a finger, a telephone pole or the edge of a building at least 20-feet away. Binoculars will pull the star in well, and a small telescope will afford a superb view. Those living east of the Minot-Laredo line will see Antares emerge during morning twilight; the farther east you go, the brighter the sky will get. For those who live east of a line running from about Saginaw, Michigan to Pensacola, Florida Antares will unfortunately reappear after sunrise. Nonetheless, the Moon should still be visible, weather permitting, and provided that it is not too hazy, a good telescope should also bring out Antares as a tiny speck against the blue sky. Adding even more interest for those who will be watching under a dark sky is Antares' 5th-magnitude companion star, which was discovered from Vienna, Austria by Professor Burg during the Antares occultation of April 13, 1819. The magnitude scale is inverted, so that larger numbers represent dimmer objects. Under perfectly dark skies, the dimmest stars that can be seen with the naked are about magnitude 6.5. Since this faint secondary star is just a smidgen west (2.7 arc seconds) of Antares, it will always reappear five seconds before Antares itself. (To appreciate how small 2.7 arc seconds is, the Moon's apparent width averages 1,800 arc seconds in diameter. So Antares and its companion are separated by 1/667 of a Moon diameter, or 0.00075 degrees!). American astronomer Mary Proctor (1862-1957) referred to it as "the wily companion of Antares." The companion star has been described as appearing emerald green or a "verdant hue," as compared to the ruddy glow of Antares. But the upcoming occultation will present a rare, albeit brief chance to gauge the companion's true color free of any contrast illusions. Back in February 1991, I had a chance to see the faint companion emerge from behind the earthlit edge of a waning crescent Moon and judged it to be a pale blue-white in color. What will you see on March 3? The disappearance of the companion will be invisible, since it occurs between the glare of Antares and that of the Moon's bright limb. In the table below, we provide a timing for 20 select locations, giving the local times and the Moon's altitude for both Antares' disappearance and reappearance. A single asterisk (*) means the event occurs during morning twilight. A double asterisk (**) means the event occurs after local sunrise. From Seattle and Vancouver, the disappearance of Antares occurs before moonrise. The information is based on predictions by the International Occultation Timers Association (IOTA) and has been rounded off to the nearest minute. For more detailed information, including maps of the occultation zone, as well as times for more than 275 cities in North America, go here. If unsettled weather prevents you from getting a view of this "Antares eclipse," you'll have at least one and possibly two more chances to see another during the next several months. 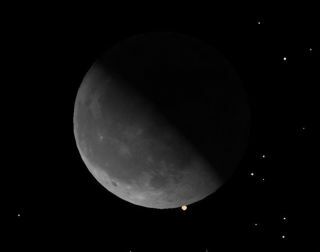 On May 24, an Antares occultation will be visible across the lower 48 states and southern Canada during the predawn hours, but unlike the upcoming March event which involves a Last Quarter ("half") Moon, the Moon on May 24 will be practically full. Another opportunity comes on the night of July 17-18, but will be accessible only across the southern United States, though elsewhere Antares and the 85 percent waxing gibbous Moon will appear to come tantalizingly close to each other. Degrees measure apparent sizes of objects or distances in the sky, as seen from our vantage point. The Moon is one-half degree in width. The width of your fist held at arm's length is about 10 degrees.